Greetings, readers! 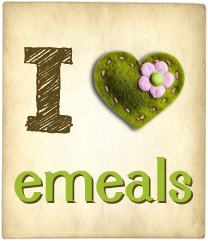 Some of you may have noticed my fancy new green button to the right there---> I'm now blogging for eMeals, a meal planning service that is awesome and not going to make much of a dent in your budget. In fact, if you haven't been planning out your meals in the past, using the service could actually save you money by helping you eliminate unnecessary purchases, trips to the store, wasted food, and helping you shop the sales! You can get the service for your family size and tailored to whatever style of food your family enjoys. Are you gluten-free? They've got it. Clean-eating? They've got it. Paleo? Natural/organic? Low carb? Got it, got it, got it. You can even add on plans for weekday lunches and breakfasts! When you realize that you can have healthy, tasty meals planned without any work from you for an entire year for less than $5 a month, I think you'll see that it's worth it. That sounds great, I've have to check it out! So excited they have a paleo option for our new diet! Yeah, it's a great idea and I was really impressed at all the special diets they cover!